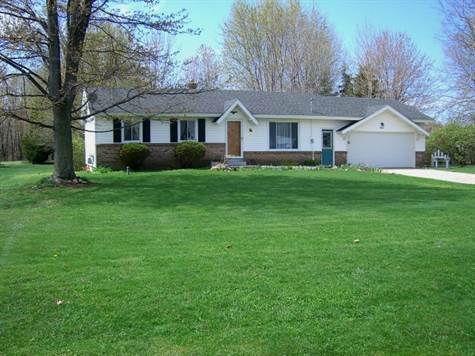 Kenowa Hills, Walker - This 3 bedroom 1 bath ranch home has had all the "majors" done in recent years. New furnace-2006; new air conditioner-2007; new water heater-2006; new replacement windows 2005; new refrigerator 2007; new slider in dining area 2005; new garage door 2000; even the roof has many years on it as it was replaced in June of 1998. So you first time home buyers . . . what will you spend your $8000 on?!?!?!?! It won't be on appliances-because those are all included-even washer and dryer! What's more is that you have a 204 square foot four seasons porch to enjoy that looks out onto the nice back yard. Clean and solid! All that is left is for you to do is remove some wall paper, paint and replace some of the bedroom carpet and this home will be immaculate!! This home has been well cared for by the same owners since it was built!. Even better it isn't a foreclosure and you won't have to wait forever because it isn't a short sale eitherjust a nice normal sale. Your MLS search tools were very easy to use on your <a href="http://www.realestatecelebrity.com">real estate website</a> We will definitely visit again! People have many ugly desires, but a house is common in them and they always expect to buy a house move there and start their new life there with much better way by https://aussiessayservices.com/ and the desires gets populous in the whole world because everyone wants one. House looks pretty attractive so the price would be, can you tell me how can I place my order on your blog if I am willing to buy a house in installments.